Accord 10 x 6 Light Oak Sidewall / Ceiling Register Discounts Apply ! Our wall vent registers have a plastic adjustable damper that will regulate both cold and hot air. These wood air vents are made from a solid red oak and are already stained. Use these wall vent registers by mounting onto the wall or ceiling with provided screws. The wood air vents will look great next to your wooden accents since they are stained in a light oak, making them blend right in. Since the wall vent registers have a plastic damper, they will not rust! Use them to diffuse both hot and cold air systems. When ordering the wood air vents, make sure to measure your wall duct opening and not an existing register. ***Hint: When ordering the wall vent registers, measure your duct opening. The 10 x 6 wood air vents will fit into a hole measuring 10 inches wide by 6 inches high. 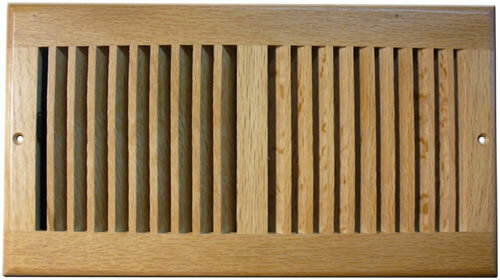 Find wall vent registers that are unfinished so you can stain to match your own wooden furniture and hardwood floors. These wood air vents are a beautiful, rust proof option when looking to replace old registers. Order today.